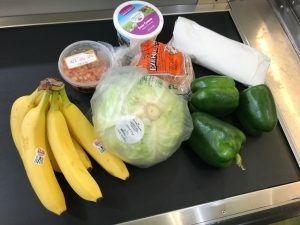 Families on a tight budget report that the cost of healthy groceries is their biggest barrier to making healthy meals at home. Food skills, like smart shopping, can help overcome that barrier. Cooking Matters at the Store is a free program of the No Kid Hungry campaign that empowers families to stretch their food budgets so their children get healthy meals at home. 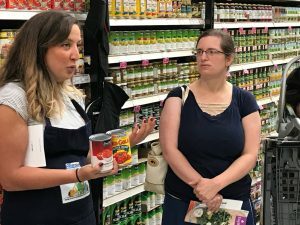 Cooking Matters at the Store for Adults is a guided grocery store tour that teaches low-income adults how to get the most nutrition for their food dollars. 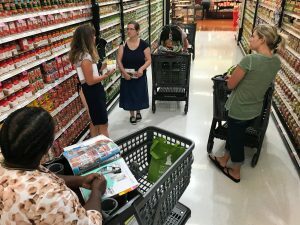 Cooking Matters at the Store for WIC Parents offers a similar hands-on learning experience but focuses specifically on parents using the Special Supplement Program for Women, Infants, and Children (WIC). 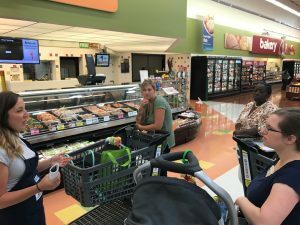 Pictured below is a tour lead by nutrition educator, Amy Macemon, at Kenosha Festival Foods and the foods purchased during the $10 Shopping Challenge.